Two Jordanian UN peacekeepers have been shot dead in the Haitian capital, Port-au-Prince, UN officials say. The soldiers are reported to have come under attack near Cite Soleil, a slum where armed street gangs are based. 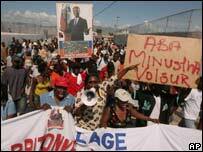 UN peacekeepers, in Haiti since 2004, have stepped up patrols amid signs that security is worsening. They were sent to maintain order after a revolt ousted the then president Jean-Bertrand Aristide but opposition to their presence has been growing. "A Jordanian UN peacekeeping patrol was targeted by unknown gunfire in Haiti. A lieutenant and a corporal died," Jordan's official Petra news agency quoted an official as saying. "The Jordanian government, which deplores the death of the two martyrs, will continue to assume its humanitarian role in restoring world peace and security," the official said. Jordan has about 1,500 troops in the Brazilian-led UN force, which includes more than 8,000 soldiers and police supported by some 1,000 civilian personnel. There have been 18 fatalities since the UN stabilisation mission began, including two Jordanian peacekeepers who were shot dead in January. Students and slum dwellers staged street protests this week calling for the UN force to withdraw. They accuse the UN soldiers of firing indiscriminately during gun battles with gang members, and killing and wounding civilians. The UN denies this, and says peacekeepers only open fire when they come under attack.